Unigine has different methods to detect intersections. Intersection is a generic point of the defined area (or line) and an object. This article describes different types of intersections and their usage. Shape and Object classes have their own getIntersection() functions. They are used for detecting intersections with the specific shape or the specific surface of the object. 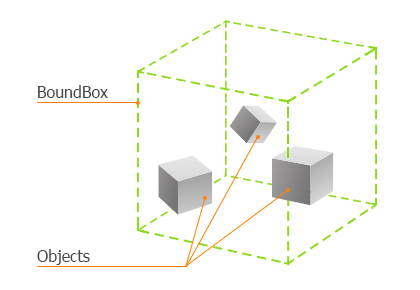 By using different overloaded World class getIntersection() functions you can find objects and nodes that intersect bounds of the specified bounding volume or find the first intersection of the object with the invisible tracing line. Functions to find nodes within a bounding volume. Functions to find objects within a bounding volume or intersected with a traced line. Functions to find first intersected object with a traced line. Schematic visual representation of intersection with nodes in bounding volume. These functions return the value indicating the result of the intersection search: 1 if the intersection was found; otherwise, 0. Intersected nodes can be found in the vector that passed as an argument to the function. Specify the type of node to search. In the example below, the engine checks intersections with a bounding box and shows the message in the console. In the update() method: the engine checks the intersection and shows the message about intersection. Schematic visual representation of intersection with objects in bounding volume. These functions return the value indicating the result of the intersection search: 1 if the intersection was found; otherwise, 0. You can pass the start (vec3 p0) and the end (vec3 p1) point of the intersecting line or pass the (BoundBox, BoundFrustum, BoundSphere) to get the intersection of objects with a line or with a bounding volume, respectively. Intersected nodes can be found in the vector that passed as an argument to the function. The following functions are used to find the nearest intersected object with the traced line. You should specify the start point and the end point of the line, and the function detects if there are any object on the way of this line. Schematic visual representation of intersection with objects and traced line. WorldIntersection intersection - the WorldIntersection class instance. By using this class you can get the intersection point (coordinates), the index of the intersected triangle of the object and the index of the intersected surface. WorldIntersectionNormal normal - the WorldIntersectionNormal class instance. By using this class you can get only the normal of the intersection point. WorldIntersectionTexCoord texcoord - the WorldIntersectionTexCoord class instance. By using this class you can get only the texture coordinates of the intersection point. Use an intersection mask. An intersection is found only if an object is matching the intersection mask. Specify the list of objects (nodes) to exclude and pass to the function as an argument. In the example below, the engine checks intersections with a raytraced line and shows the message in the console. Physics intersection function detects the intersection with a shape of bodies. If the object has no body, this function detects intersection with surfaces (polygons) of the object with intersection flag. When you need to find the intersection with the shape of the object (not with polygons), the intersection function of Physics class is the best way to get it. The picture above shows how the getIntersection() function detects the shape that intersects with the line. These functions perform tracing from the start p0 point to the end p1 point to find a collision object (or a shape) located on that line. Functions use world space coordinates. Use an intersection mask. An intersection is found only if an object is matching the intersection mask, otherwise it is ignored. Specify the list of objects to exclude and pass to the function as an argument. Check, if there is an intersection with an object with a shape or a collision object. The getIntersection() function returns an intersected object when the object intersects with the traced line. In this example, when the object intersects with the traced line, all the surfaces of the intersected object change their material parameters. If the object has a shape, its information will be shown in console. The PhysicsIntersection class instance gets the coordinates of the intersection point and the Shape class object. You can get all these fields by using getShape(), getPoint() functions. 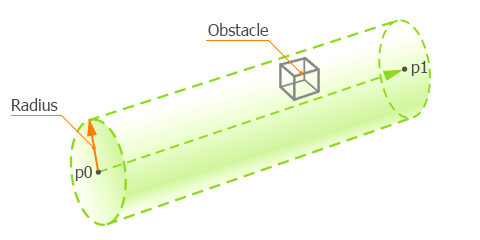 The engine creates an invisible cylinder with specified radius between two points and checks if an obstacle is presented inside of it. Schematic visual representation of intersection with objects and cylinder volume. These functions return an intersection information and a pointer to the nearest obstacle to the start point (p0). Information about the intersection will be presented in the GameIntersection class instance which you pass to the function as an argument or in the vector. Use mask and exclude arguments of the overloaded function to specify the obstacle search. Use an obstacle intersection mask. An intersection is found only if an object is matching the intersection mask, otherwise it is ignored. Specify the list of obstacles to exclude and pass to the function as an argument. 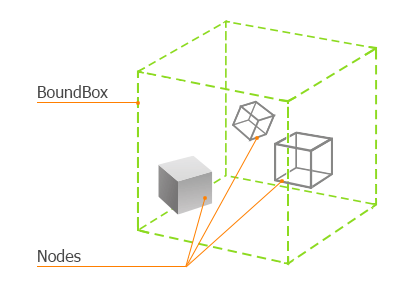 Create an instance of the ObstacleBox class on the application initialization.